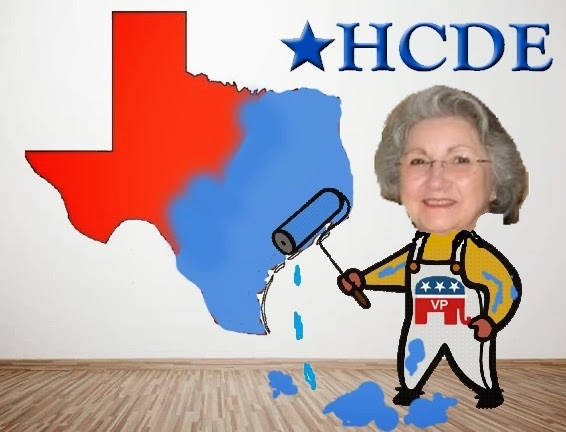 HCDE Helping Turn Texas Blue??? All I really wanted was an outline of the day to day activities of HCDE. 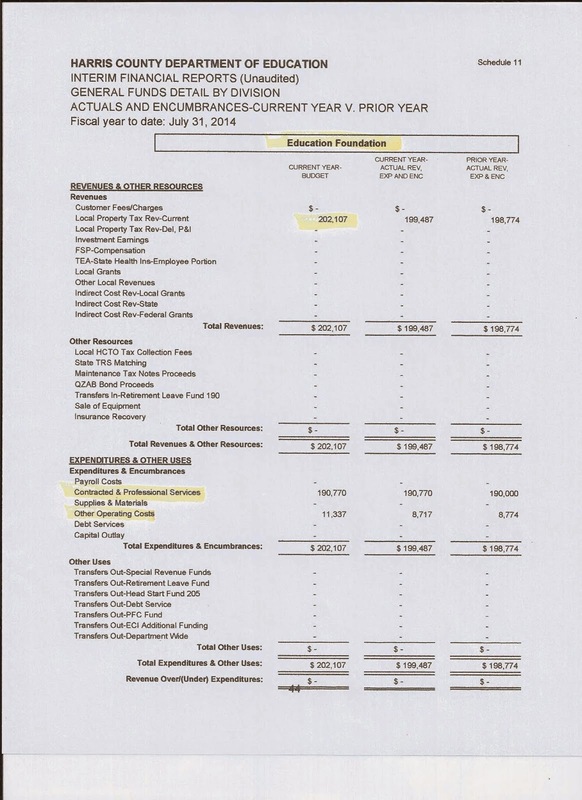 Instead, I got an outline of how HCDE is using our tax dollars to influence elections. “George, my request is that you help get the word out to your readers to vote for Dianne Williams and RW Bray for the HCDE Board of Trustees. 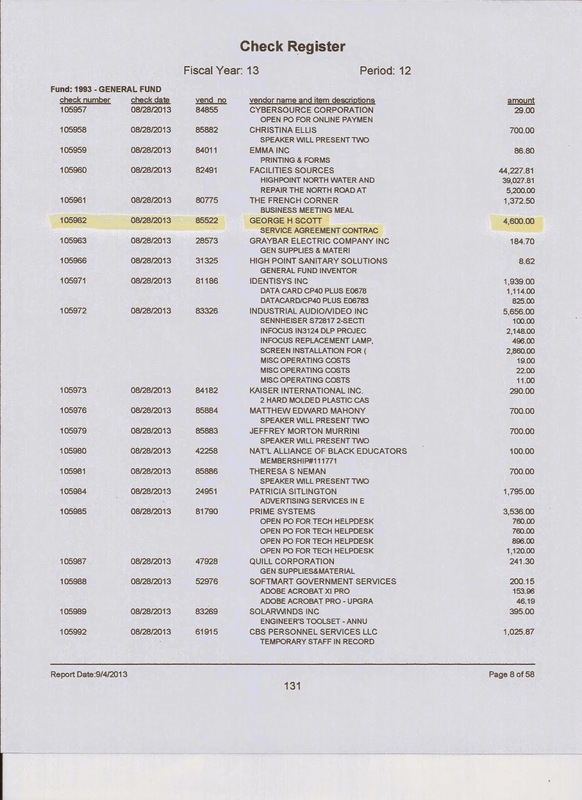 Records show Scott has received funds numerous times from HCDE. 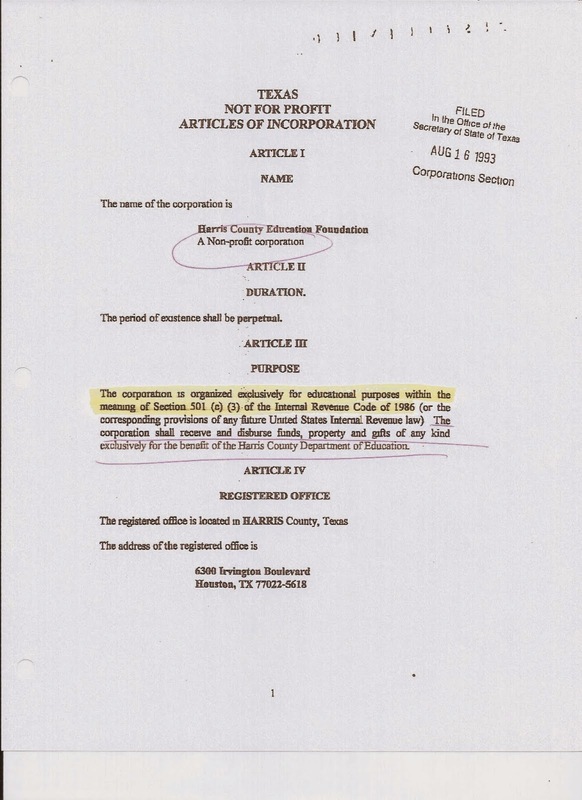 As a matter of fact, HCDE’s response to an open records request to view publications paid for by HCDE in 2013, incuded blog posts written by George H Scott. Some were posts critical of the Harris County Appraisal District and the rest were stories flattering to HCDE. It does appear, however, that Scott did not have a contract with HCDE at the time of Chesnut’s request. Emails show Scott did submit a new proposal to HCDE for more consulting work by May. 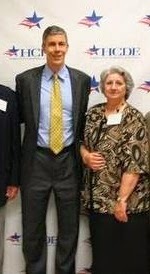 If Chesnut had asked a blogger who did not contract with HCDE, there would not be an issue. But, for an elected official, who casts votes on government contacts, to ask an off-on-again contractor to “help” her influence the outcome of the Republican primary election of her own board is, to say the least, inappropriate. Lack of ethics to influence elections is one thing. Use of public employees and public funds is a whole different ballgame. 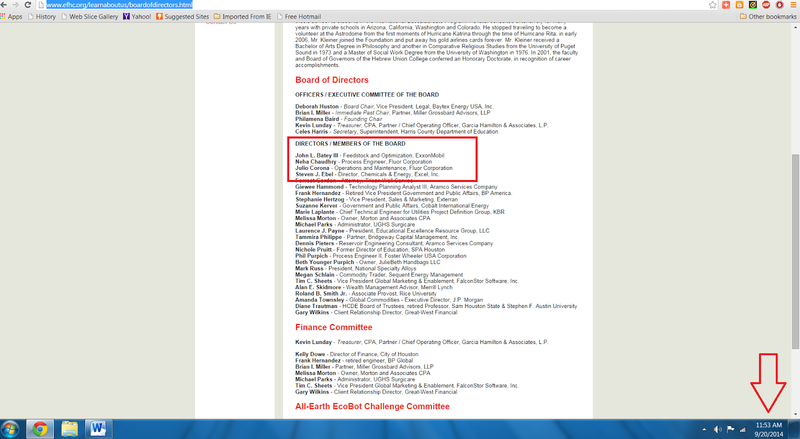 two paid staffers for the Wendy Davis for Governor Campaign. If the call had been to Sen. Wendy Davis in her capacity as a State Senator, there would not be an issue. If the call had been on their personal time using their personal phone systems, there would not be an issue. But, the taxpayers paying for the facilities, the phone and emails systems, the salary to set up the call, as well as the salaries and consulting fees for HCDE to participate in a call with the campaign of the Democrat candidate for governor is, to say the least, HIGHLY QUESTIONABLE. 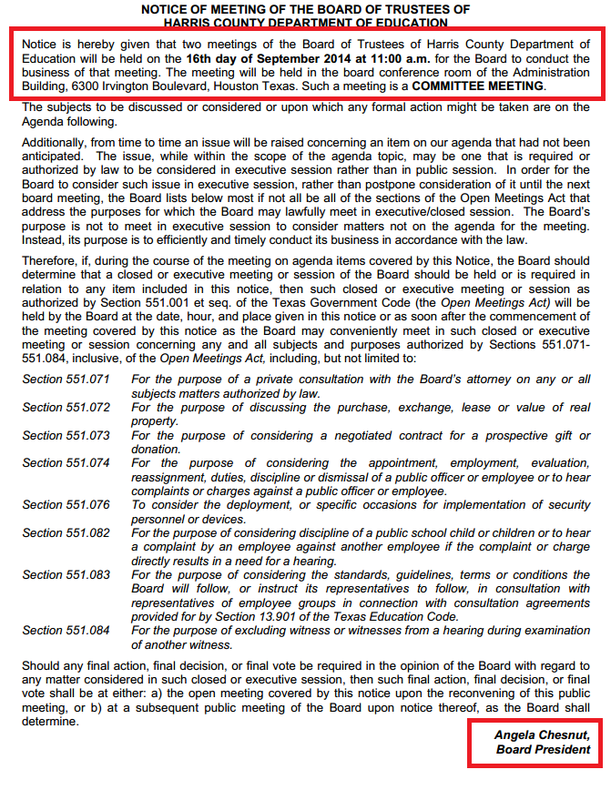 Texas Statute does not allow the use of school district facilities and/or personnel to support candidates or parties. On 3/27/14 HCDE’s Education Foundation Board of Directors held their meeting at the HCDE Administration Building, a building supported completely with public funds. 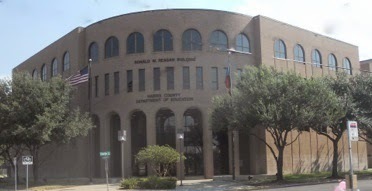 In this case, not only did taxpayers pay for the facilities to hold the meeting and the email system to distribute the Democrat candidate endorsements, this year HCDE Board of Trustees donated $202,107 of our tax dollars to the Foundation just to fund the position of Director as well as to provide his office facilities in the HCDE Administration Building. 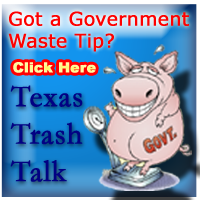 Texas Statute also does not allow school district email systems or other public funds to be used for political advertising. IRS rules do not allow a 501(c)(3) to endorse candidates. HCDE’s Foundation’s charter does not allow them to participate in publishing or distributing statements relating to campaigns. In a quick look at the alphabetical list of Directors/Members of the Board on the Foundation website, the first name you see is Judge Eric Andell, Senior Justice, First Court of Appeals. This makes one question why a Senior Justice didn't stop the Foundation from breaking the rules. 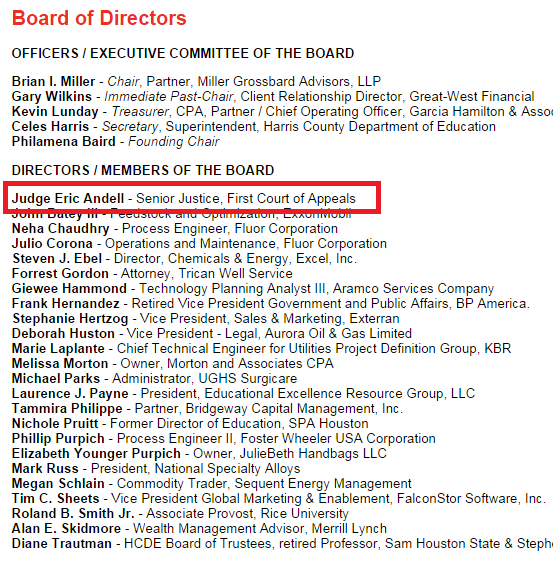 A check of current judges serving the Texas Appellate Courts does not list Eric Andell. Makes me wonder what else on the Foundation website might be questionable, or at least, slightly inaccurate. 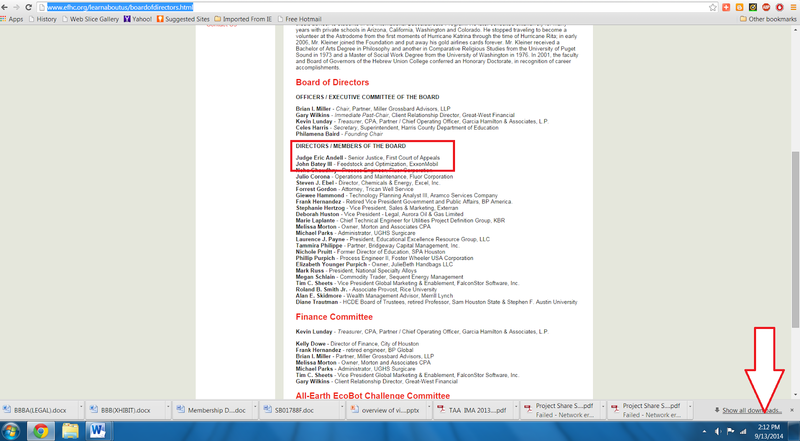 Note: The Foundation just changed its website removing Judge Andell from their Director's list. That was fast! On the left you will see the screen shot I took on 9/13/14. On the right you will see the page today. Her HCDE duties also include keeping the board “informed” on pressing issues. 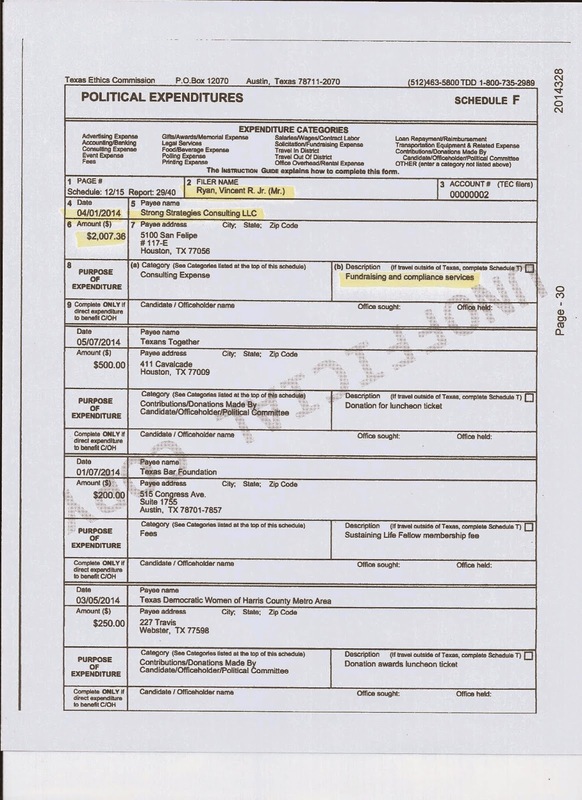 The email review shows the type of “information” she sends to the HCDE Board in their weekly packet as well as the personal comments she writes in the upper right hand corners. Two examples are below. 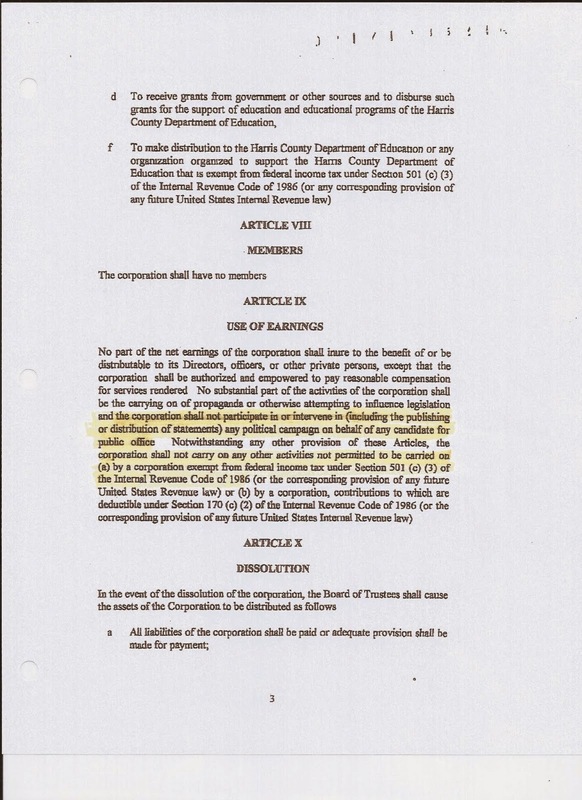 Should taxpayers really be paying for a political consultant to forward a story to a school board that reads…..? Reviewing all these emails made me very curious as to what Pat Strong reports to the HCDE Board Government Relations Committee. 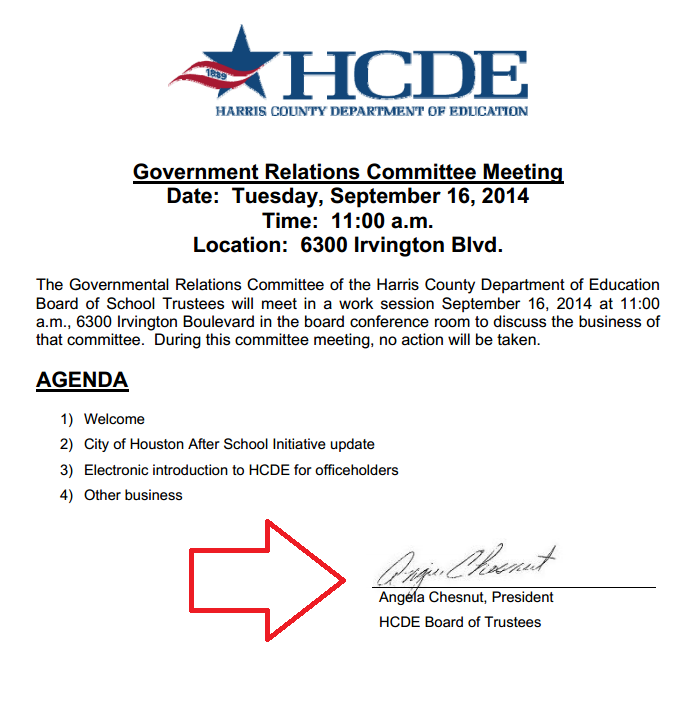 So when HCDE posted a public meeting of the committee on their website for 11:00 am on 9/16/14, I attended. I arrived a few minutes early with my cell phone camera fully charged. Pat Strong (lady on the left with the white hair) was already seated with her report ready to present. At 11:00, President Angie Chesnut opened the meeting. Chesnut: Good morning everyone. Well, I guess the meeting is now in order. What…It is not a meeting. (difficult to understand) That’s right. It is a committee meeting. Chesnut: Oh true. So, with no further ado, let’s get started with Pat giving us an update on different things that have happened. Chesnut: Oh, since this is not an open meeting, I am going to have to ask you to leave Ms Vera, if you don’t mind. It is a closed committee meeting. Board Attorney: It is not a meeting under the Open Meetings Act since there is no quorum. Chesnut: It is not a posted meeting. AFTER Pat Strong completed her report, President Chesnut changed her mind and decided the public could view the rest of the committee meeting, even though they still did not have a quorum. By the end of the committee meeting, a board quorum was present. 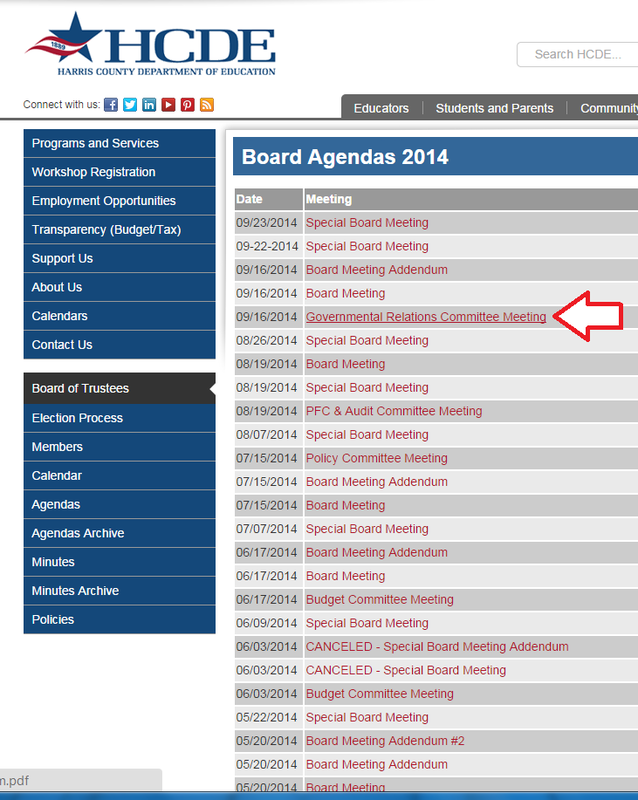 In a quick check of the HCDE website, under Board Agendas, you will find the official posting of the meeting with Angie Chesnut’s signature. What was in Pat Strong’s report to the committee that President Chesnut felt the need to hide from the public? I may never know. But I do know that if this was a government entity using government funds and a 501(c)(3) to promote conservative Republican candidates and issues, the IRS would remove their tax exemption immediately and I’d bet our County Attorney would order an investigation. But these government funds and the 501(c)(3) are being used to support liberal Democrat candidates and issues, so I won’t hold my breath waiting for any investigation. Congresswoman Sheila Jackson Lee’s daughter, Erica Lee Carter, is a current HCDE Board Trustee so I don’t expect to see any action from the IRS. In his most recent campaign financial report, our County Attorney, Vince Ryan (D) lists payments to Pat Strong for “fundraising and compliance services” so I don’t foresee any action coming from that office either. It’s stunning to me that a cursory review of emails turned up so many examples of apparent violations of state and federal statutes. I will certainly dig deeper before drawing any final conclusions. in my opinion, is nothing short of shameful.